At first the blooms were all pink and then all a sudden they were a mixture of pink and white. I did cut off a few branches and before I knew it I had 5 pots of cacti plus the big mother plant, which is in the first picture. For the first time this year the mother plant started to bloom 2 weeks before Christmas, both white and pink blooms, and one by one each of the other 5 potted plants started to bloom, some white and some pink. 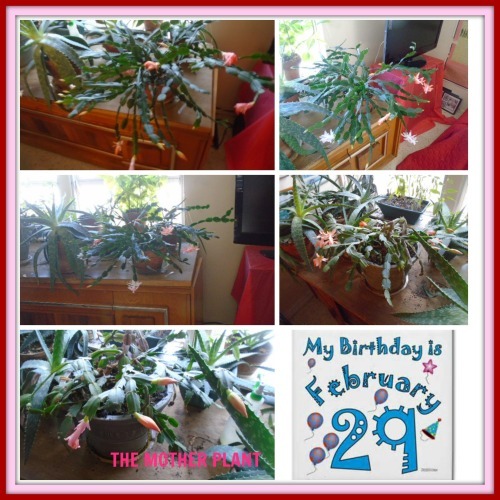 Since then all the plants have remained in bloom and now a week before my 20th Leap Year birthday February 29 there are buds on all the plants! This slideshow was taken over the past 2 months. This slideshow was taken over the past 5 years.